DC Strokes Rowing Club (DCSRC) is committed to building an inclusive environment, fostering personal growth, and promoting a spirit of sportsmanship. 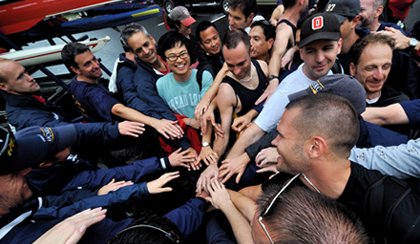 DCSRC programs offer opportunities for all rowers, regardless of experience level. Today, DCSRC is one of only a handful of dedicated, independent LGBT rowing clubs in the world, along with the Chicago Rowing Union, the San Francisco Bay Blades, and the Melbourne Argonauts in Australia. The team began in 1991 with eight gay runners looking for a cross-training activity, some old rented equipment, and a lot of enthusiasm. It took only two or three years for the team to grow into a cohesive organization that was competing regularly and ready to make the commitment to purchase racing shells and other equipment. Originally rowing on the Potomac River, DCSRC became a proud member of the Anacostia Community Boathouse in 2004 and now rows on the Anacostia River. DCSRC is also a member organization of USRowing Association. DCSRC holds fast to the conviction that LGBTQ+ rowers can be formidable athletes and competitors. Our goal is for DCSRC to be a platform for competitive success and to increase the profile of LGBT rowers in the rowing community while promoting a spirit of camaraderie amongst our members. Our programs are open to all rowers, and we aspire foremost to create a safe and supportive environment for LGBTQ+ rowers and their allies. Empowering and raising the visibility of LGBTQ+ athletes. DC Strokes is a volunteer-run organization. We are a not-for-profit organization and tax exempt under Section 501(c)(3) of U.S. IRC. Contributing to DC Strokes could have increased tax benefits for you and your organization. Consider donating online to DC Strokes today. ©2019 DC Strokes / SportsEngine. All Rights Reserved.